You can call the Ecuadorian government’s disconnection of WikiLeaks founder Julian Assange’s internet connection and ban on contact with the outside world a lot of things: unfair, treacherous, a signal of surrender to the West. Such was the reaction of internet users and journalists throughout the world following an announcement by Ecuador that it had suspended Assange’s ability to accept visitors or communicate with the outside world. In effect, Assange — an Ecuadorian citizen — is now being held in incommunicado detention without any legal basis in spite of his constitutional rights and the diplomatic immunity his residency at the embassy grants him. It’s bizarre for a country to grant someone political asylum, then condition it on being barred from communicating with the outside world. Makes a mockery of asylum. Once proudly defiant, Ecuador is now depicting itself as rather subservient to the west. The move to place Assange under virtual solitary confinement is hardly a surprise for those who have observed Ecuador’s policy reversals since Lenin Moreno assumed the Andean republic’s presidency last May. The regional significance of the gesture can’t be understated, given the importance South America’s once-dominant Left attached to the libertarian WikiLeaks founder for having brought the U.S. empire “to its knees,” as late Cuban leader Fidel Castro wrote. Moreno delivers Ecuador to the United States, another betrayal of our people and the Patria Grande [the Latin American nation]. Assange’s days in the Embassy of Ecuador in London are numbered. Beginning his decade in power as a young economics professor with a fresh face and little background in politics, Correa set Ecuador on a course that rejected neoliberalism. He instead sought to achieve social and development gains in a country paralyzed by successive dysfunctional governments that served the regional interests of the political class or partidocracia. He earned the ire of Washington and the U.S.-loyal security establishment after forging an alliance with Hugo Chávez’s Venezuela and expelling the U.S. Air Force from its base in Manta, which also served as a major hub for CIA operations in the region. However, when Correa’s time in office ended, his legacy was dampened by clashes with social movements, a reliance on Chinese development finance, and an economic downturn toward the end of his tenure brought on by a collapse in oil prices and a devastating earthquake. A rather uncharismatic and bland figure in comparison, Moreno began his stint in office with a narrow mandate after winning the presidential election by a mere 2 percent. From the start, he had the support of Correa’s popular base, but raucous opposition protests confirmed that he was weighted down by the baggage from his predecessor’s decade in office. Moreno promised to uphold the Citizens’ Revolution, praising Correa as “our great leader” and “our eternal president.” Yet, during the transition, rumors swirled of angry clashes between the two figures at the Carondelet presidential palace. Meanwhile, gringos connected to the U.S. Embassy whispered that diplomats there were rubbing their hands with glee over the inevitability of a breakthrough in relations with Ecuador. Despite being named after Russia’s Bolshevik revolutionary leader, Vladimir Ilyich Lenin, Moreno wasn’t a fiery Chavista or Correista, let alone a communist; here was a “pragmatic” man, friendly toward the business community and eager to escape his predecessor’s shadow. Moreno welcomed the visit and expressed his admiration for the United States … He said that Ecuador had to get past its cultural inclination to always play the ‘blame game’ with respect to its problems, which so often includes blaming the U.S. for one thing or another… He will be a useful partner and advocate for many of our development assistance programs, and he will likely also be a useful and strategic conduit for political messages that may be difficult to deliver directly to Correa. Moreno’s usefulness to Washington didn’t reveal its full potential until a decade after the memo, when his intentions became clear: he would lead Ecuador’s exit from the “pink tide” and return the country to the region’s U.S.-loyal neoliberal fold. 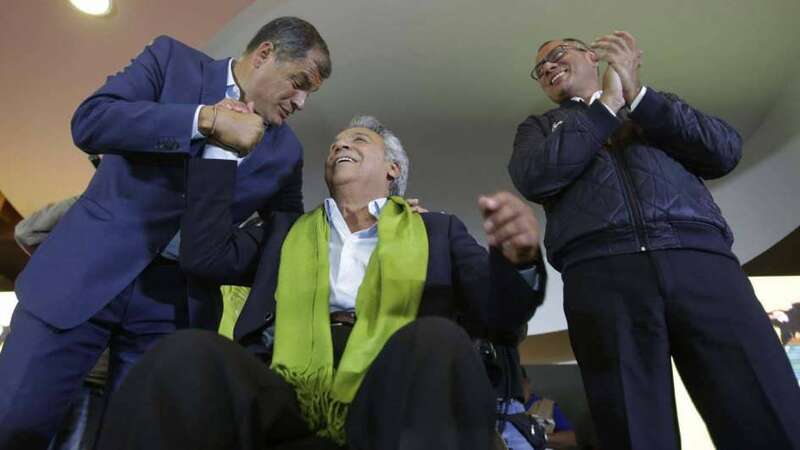 Upon coming to power, Moreno didn’t waste any time before changing his tone regarding the “eternal president.” Correa was suddenly described as fiscally irresponsible and guilty of massive spending that saddled the country with enormous debt. In the name of “national dialogue,” Moreno would open up the country’s political space and work alongside the right-wing opposition, the wealthy urban power centers, and the financial sector to “solve” the problems created by the Citizens’ Revolution. His new agenda included the imposition of austerity measures; privatization of public assets; the repeal of taxes on capital gains; cutting back regulations on businesses; handing control over electronic transactions to private banks; handing out new mining concessions to extractivist firms; and curbing China’s outsized economic role in the country, while seeking rapprochement with North America and Europe. Pledging to rid the country of a “sheepish mentality” — alluding to the opposition slur against leftist masses of “sheep,” considered too poor and uneducated to practice politics — the president plowed forward in an alliance with a rogues’ gallery of right-wing politicians who embodied the Ecuador of the past. How barbarous… Cynicism, betrayal and mediocrity will be fleeting! In response, Moreno claimed that Correa was no less than an Antichrist-like figure stricken with withdrawal symptoms from his loss of power, whose rule was marked by authoritarianism, national discord, and mafia-style corruption at all levels. “The Beast,” Moreno joked, must be prevented from returning to power once the presidential term ends. The once-divided opposition — including such figures as the eccentric banana oligarch; the former football player and president nicknamed El Loco, who was impeached after a mere six months; the notorious banker who represented the right in the last elections; and other mainstays of Ecuadorian politics — uniformly applauded Moreno. They were especially pleased after Correa’s close friend and ally, Vice President Jorge Glas, was sentenced to six years in jail and stripped of his position following a corruption trial riddled with irregularities. The “traitor” then set about using legal measures to deprive Correa loyalists and dissidents from positions of influence within the ruling PAIS Alliance, replacing them with party figures whom Correa accused of selling out “for a plate of lentils.” With the ex-president at the lead, 28 members of the National Assembly quit the party Correa had co-founded in 2006 and formed a new movement that remains unrecognized by electoral authorities. 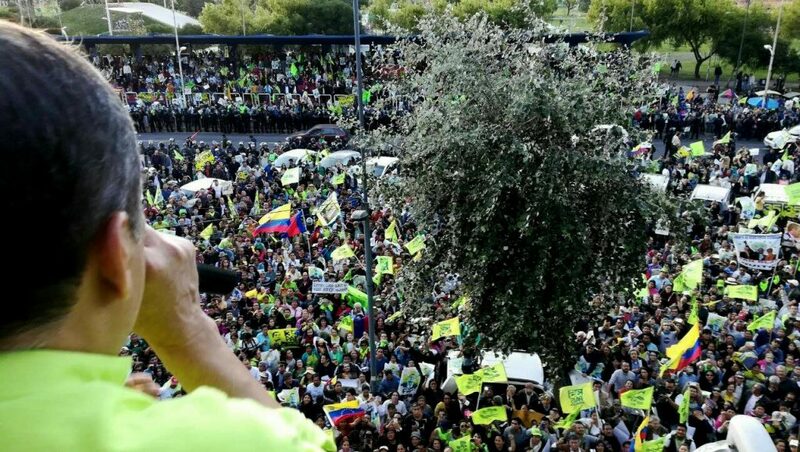 Is the Conflict Within Ecuador’s Center-Left a Turn to the Right? In February, Moreno’s final move to prevent Correa from returning to office came in the form of a constitutionally dubious “popular consultation” consisting of seven questions relating to political, environmental and economic issues. Voters were asked if the government could place a lifelong ban from politics on those found guilty of corruption, while term limits would be reintroduced for heads of state, including for nonconsecutive terms. Private and state resources were mobilized in support of the proposals while Correa, who desperately toured the country campaigning for a “no” vote, faced a near-total media blackout and even violent attacks by political opponents. 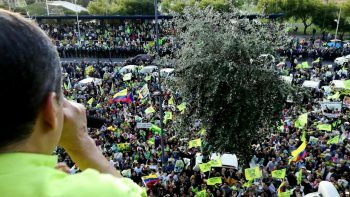 With dozens of parties and movements backing a “yes” and only the Correistas opposed, the referendum passed by a nearly two-to-one ratio, blocking the former president’s chances of ever running again. International monitors and local analysts questioned the legality of the process. It’s going to be very difficult for a mediocre person like Lenín Moreno to keep everyone happy … The only thing that unites these people is their hatred of Correa, not even love of country. Ecuador’s new government wasted little time shifting gears on foreign policy matters. Months after assuming office, Moreno sacked the ambassadors to Venezuela and Cuba while cautiously distancing Quito from Caracas, which was being rocked by protests against Nicolas Maduro’s Bolivarian government. 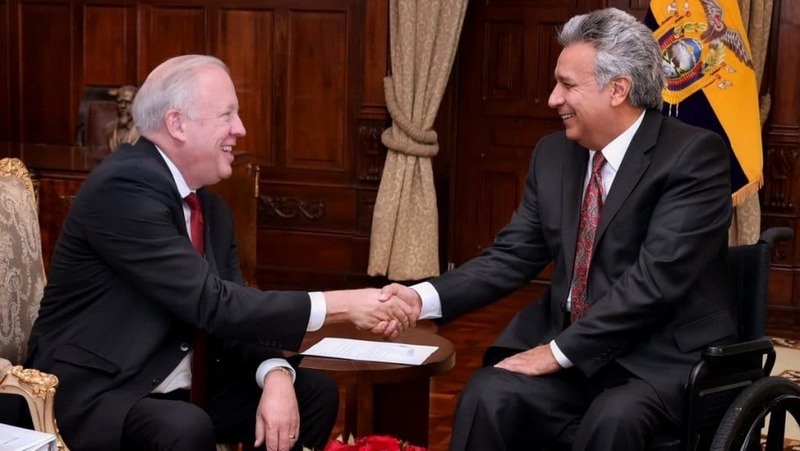 As Moreno’s foreign policy veered further right and with the Trump administration prioritizing the shutting down and punishing of Assange, it appeared inevitable that Washington and Quito’s rapprochement would converge on the notorious London Embassy guest. “It is a problem that would be annoying for any country in these circumstances,” he added. Correa responded with a warning that Assange would soon find himself in the crosshairs of Moreno’s push to curry favor with Washington. “It will only take pressure from the United States to withdraw protection for Assange,” Correa told AFP, adding that an agreement had likely already been worked out between the administrations of Trump and Moreno. They don’t keep him at the embassy out of conviction, Moreno is not a man of conviction; [but] it doesn’t suit them to remove him at this very moment … sooner or later, that moment will come. Amid a spate of attacks on Ecuador’s security forces earlier this year near the border with Colombia that has been blamed on alleged ex-guerilla drug traffickers, the FBI was invited to establish a presence in the country to assist in investigations. Critics read the move as another sign of Moreno’s treason, citing the well-documented historical role the bureau played undermining leftist organizations and popular movements in the country during the last century. Politicians like Assemblyman and retired General Paco Moncayo used the attacks to build their case for why Moreno should do more to undo the “very serious errors” by Correa, such as the “dismantling of relations and cooperation” with the U.S. and closure of the U.S. military post at Ecuador’s Manta air base. Removing the Manta base and not having any plan to replace it was silly and irresponsible. [Correa’s government] left the country defenseless against threats as terrible as narco-traffickers. Assange was finally disconnected from the outside world just as two top-level officials from the U.S. military’s Southern Command were visiting Quito to discuss the reestablishment of U.S.-Ecuador security ties. According to the U.S. officials, their Ecuadorian counterparts conveyed an interest in the return of American military personnel. At the same time, Ecuador’s commerce minister announced that negotiations with Washington to implement a long-shelved free-trade deal would soon begin. 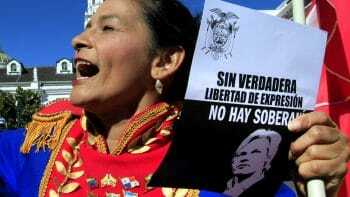 This wasn’t the first time that Ecuador silenced the WikiLeaks founder. In October 2016, Assange was temporarily barred from the web out of concern that he would release further information that could impact the U.S. elections. His access was eventually restored following Election Day. According to Ecuador’s authorities, the final straw was allegedly Assange “not being able to control” himself regarding both British accusations that Russia poisoned ex-double agent Sergei Skripal and Germany’s arrest of Catalan pro-independence leader Carles Puigdemont. For its part, WikiLeaks claims that Assange is being punished for revealing the “‘Watergate’ of Ecudor” [sic], a tranche of leaked emails revealing alleged agreements between Italy’s Hacking Team and Ecuador’s now-disbanded SENAIN intelligence agency. Clearly, Ecuador’s government has been subjected to bullying over its decision to grant Julian asylum, support and, ultimately, diplomatic status. Naturally, Quito cannot admit that it is buckling under that pressure and it argues, in public, that Julian’s tweets over Catalonia are responsible for the decision to isolate him. Given Ecuador’s realignment with Western capitals, the move to gag Assange was just as much a matter of choice as a matter of coercion. His access to the web likely won’t be restored this time around. One can only offer suppositions, but the possibility suggests itself with perfect clarity: Assange, once Ecuador’s symbol of defiance toward imperialist domineering in the Global South, is being made into Ecuador’s sacrificial offering in a gesture of fealty to Washington and Europe.